Google Glass: The End of Privacy? 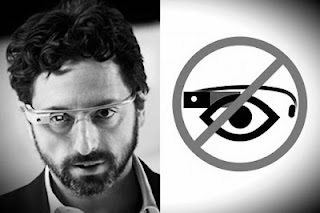 A year ago, Sergey Brin showcased a futuristic piece of hardware that could literally change the way you see the world. Every techie was excited because let's face it, no other technology rivals a pair of Internet-powered glasses that can let you make calls, take pictures, search the web, and much more. What's more, you won't have to carry a smartphone in your hand every time. At present, journalists are busy churning out articles after articles debating whether Google Glasses are a privacy threat or not. Further dampening the excitement of a Google-lover like me comes the news of Google Glass bans that are surfacing in many places across the United States. Casinos and cafes have already banned the futuristic eye-wear and more bans are expected to follow. So, is the advent of this new technology already putting us into a 1984-esque environment wherein our every move is watched? That’s maybe a gross exaggeration, but aren't these new technologies doing more good than harm? Despite what the critics and the privacy paranoids say about Google Glass, it is, indeed, a marvelous piece of technology. Without using your hands, you can now search the whole web, take pictures, shoot a video, send an email...whoa...a few years ago an iPhone app looked like a modern marvel. Another great thing about Glass is that developers can create app for this eyewear, thus making it even more lucrative for people who swear by web applications. Overall, Google Glass promises to be the next big thing after Android. And yes, if it takes of very well, who knows, we might have a Microsoft and Apple killer on our hands. But wait...what about our privacy? Google Glass and privacy...these two words have been mentioned hand-in-hand a lot these days. As modern as the technology seems, Google Glass is definitely a privacy threat. Imagine a stranger walking into a cafe and taking pictures of you without you knowing it. That would definitely turn any person off. The power that Glass gives a normal person is mind blowing; however, this can also lead to an active misuse of the technology. Not just cafes, many places are banning this technology for being too intrusive. The very fact that a piece of eyewear can see and record everything that a person looks at is scary for many people. Every time you see a person opposite you wearing such a device, it's natural to feel a bit cautious since everything you do might be watched. That said, many people have claimed that the Google Glass privacy scares are nothing but exaggerations. Famous blogger Robert Scoble is a huge proponent of the technology and he doesn't mind seeing a widespread adoption of technology. At this stage though, it would be wise to wait till Glass gains a significant market share. Then and only then the privacy issues can be discussed. Apart from issues with privacy, Google Glass may also cause some other problems. The eyewear can let people cheat in casinos, exams, and many other areas. Also, a recent New York Times article stated that Google Glass might actually be potentially dangerous. The reason behind this is that it may not allow its users to see something that is utterly obvious thereby causing accidents. Moreover, having a conversation with a person using Google Glass might seem a bit awkward. You're looking into the person's eyes while he or she is intermittently looking up thus leaving you a bit confused and uncomfortable. Despite what many critics say, Google Glass is a revolutionary product. Whether it gets the recognition it needs is another story, but it surely has got everyone excited. Also, it has ushered in a new era wherein tech products are becoming an integral part of our daily lives. Google Glass, despite its privacy issues, is something that should pave way for other products that will let us further integrate our lives with technology. Overall, Google Glass is a potential privacy breach, but it's also something that marks a dramatic shift in how we see the world.